History’s forgotten nuclear disaster Everybody knows of the nuclear catastrophes of Chernobyl and Fukushima But how many know of the Mayak nuclear nightmare? The Mayak nuclear plant in the Southern Urals was one of the dark secrets of the cold war. It was the Soviet Union’s primary nuclear complex, a massive set of plutonium production reactors, fuel production facilities, and reprocessing and waste storage buildings. In 1957 a storage tank with highly radioactive liquid waste exploded. More than half the amount of radioactive waste released by the accident in Chernobyl was blasted into the atmosphere. A few villagers were evacuated, but most were not. 217 towns and at least 272,000 people were exposed to chronic levels of radiation. The plume was 50 kilometers wide and 1,000 kilometers long. But the explosion wasn’t the only incident of contamination. Between 1948 and 1956 radioactive waste was poured straight into the Techa River, the source of drinking water for many villages. It exposed 124,000 people to medium and high levels of radiation. Nuclear waste was also dumped into the lakes of West Siberia, where storms blew nuclear dust across a vast area around the lake. The Mayak nuclear plant exploded in 1957. But its legacy of radioactive pollution had been going on even before this. Half a century later, Mayak is one of the most radioactive places on Earth, and the accident continues to have a devastating legacy. Many thousands of people have never been evacuated from contaminated areas. 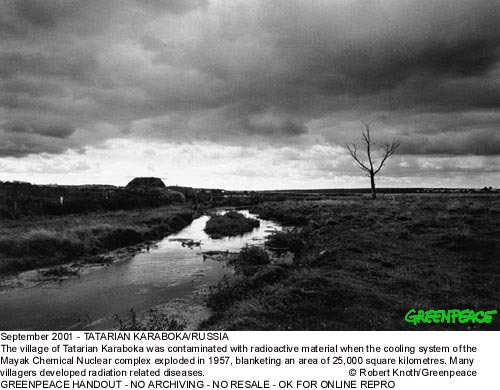 The Most Contaminated Spot on the Planet http://www.wentz.net/radiate/cheyla/index.htm For forty-five years, the Chelyabinsk province of Russia was closed to all foreigners. Only in January of 1992 did President Boris Yeltsin sign a decree changing that. As a result, western scientists who studied the region, declared Chelyabinsk to be the most polluted spot on earth….. Soon after the Mayak nuclear complex became operational, death and diseases in the region increased dramatically due to the dumping of medium and high level radioactive waste into the river system. As a result, 22 villages on the riverbanks, in a 50 km downstream zone from the complex, were evacuated. The village of Muslymova, just outside the 50 km zone was particularly contaminated, but it was never evacuated. Muslyumova lies 45 km north west of Chelyabinsk city and has 4,000 inhabitants. The village had no wells and until recent years depended on the river Techa, for drinking water. The villagers of Muslyumova grew increasingly ill following contamination of their water. The number of birth defects and cancer deaths soared, but the authorities refused to take remedial measures. Statistics show that gene-mutations in the villages just outside the evacuated zone were 15 times the average for the Russian Federation. The local authorities attributed the high level of birth defects among newborns and the high mortality rates to a low standard of living. A report on the health of the people living on the banks of the Techa River was published in 1991, which showed that the incidence of leukemia increased by 41% since 1950. From 1980 to 1990, all cancers in this population rose by 21% and all diseases of the circulatory system rose by 31%. These figures are probably gross under-estimations, because local physicians were instructed to limit the number of death certificates they issued with diagnosis of cancer and other radiation-related illnesses. According to Gulfarida Galimova, a local doctor who has been keeping records in lieu of official statistics, the average life span for women in Muslyumovo in 1993 was 47, compared to the country average of 72. The average life span of Muslyumovo men was 45 compared to 69 for the entire country. Chelyabinsk regional hospitals were not allowed to treat the villagers and they were sent to the Ural Centre for Radiation Medicine. The medical data of the UCRM was classified until 1990. Records of the UCRM chart the decline in health of 28,000 people along the Techa and all of them are classed as seriously irradiated. Since the 1960s, these people have been examined regularly by public health officials. According to the head of the UCRM clinical department the rate of leukemia has doubled in the last two decades. Skin cancers have quadrupled over the last 33 years. The total number of people suffering from cancer has risen by 21%. The number of people suffering from vascular diseases has risen 31%. Birth defects have increased by 25%. Kosenko carried out a small epidemiological study of 100 people selected at random. From this group 96% had at least five chronic diseases (heart diseases, high blood pressure, arthritis and asthma), 30% had as many as ten chronic conditions. Local doctors estimate that half the men and women at child bearing age are sterile. Even today, the local population still does not know the actual levels of radioisotopes in its home grown products. German scientists who did a field study in Muslumova in 1996 have measured some food samples in the villages and found astonishing levels of radioactivity, 17,000 becquerrel per kg in fish, and 8,000 per kg in vegetables (in Europe, products with more than 600 bequerrel are taken off the market). Only since 1989, the villagers have started to get information about the dangers of the radioactive contamination of their river. Another forgotten nuclear disaster: Tokaimura, Japan-over a decade ago just outside Tokyo. It began when cost-cutting and sloppy work led to a fission chain-reaction at a uranium-processing plant in Tokaimura, 70 miles northeast of Tokyo, in 1999. The Tokaimura incident was Japan’s worst nuclear-related accident. Two people were killed, thousands of people were exposed to at least moderate levels of radiation and the town center had to be temporarily evacuated during a cleanup. Company officials have said they were worried that if the public became aware of cracking at the reactors, people would be frightened. The government gave Tokyo Electric the name of the whistle-blower who reported the cracking to the company, in a further effort to keep things quiet. Around 80,000 people are believed to have been sentenced to work in the uranium mines by the Czechoslovak communist regime which was keen to fulfill a contract signed in 1947, before the communist party grabbed total power, to supply the raw material for atom bombs to the Soviet Union…..
that part of Czechoslovakia was supposed to be under the jurisdiction of the occupying US military. approached the ends of their sentences. This article is really helpful and I really thank you. Article is somewhat misleading. Photo of nuclear plant leads reader to believe it is Mayak facility when in fact it is the Chernobyl Unit 4. Be careful of what you read. Always check multiple, independent sources for corroboration with what is fact and what is not. Thank you, Mike, for picking this up, and letting me know. My mistake. I have now replaced that photo with a correct photo relating to the Kyshtym disaster at Mayak .